Today is the 70th birthday of a very dear friend. I’ve been going to church with Mary Carol my whole life! In honor of her birthday, I made two decadent chocolate cakes. Since we celebrated after church on Sunday, I made a chocolate sheet cake so there’d be lots of cake to go around. This was pretty popular, and seemed to bring back lots of memories for other people of cakes they’d had in their childhood (Texas sheet cake and crazy cake were mentioned). I, personally, would cut back on the sugar in the frosting, but I tend to like things a little less sweet. In a large mixing bowl, sift together flour, sugar, and salt. In a saucepan, melt butter. Add cocoa and stir. Add the boiling water, allow to boil for 20 seconds, then turn off the heat. Pour over the flour mixture and stir lightly to cool. In a measuring cup, pour the buttermilk and add beaten eggs, baking soda, and vanilla. Mix buttermilk mixture into the chocolate/flour mixture. 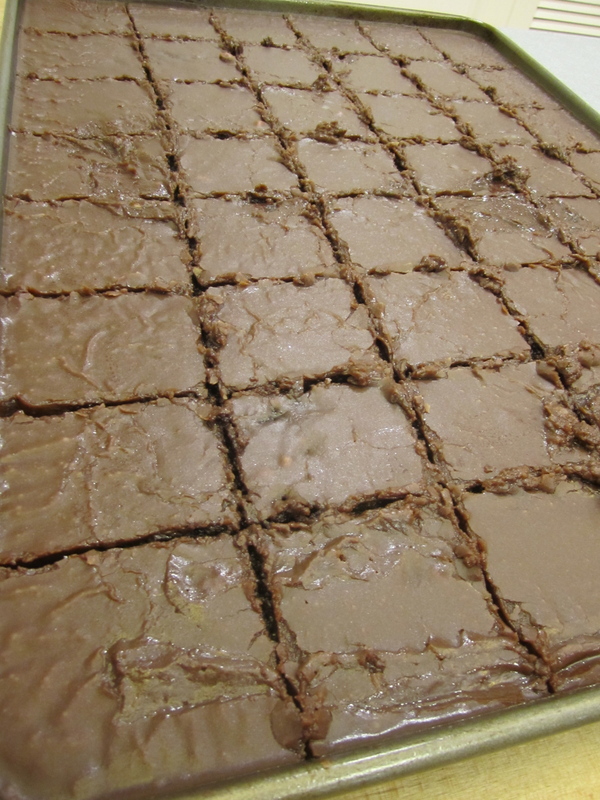 Pour batter into a large sheet cake pan (18″x13″) and bake at 350°F for 20 minutes. Melt butter in a saucepan. Add cocoa and stir. Turn off the heat and then add milk, vanilla, and powdered sugar. Mix well and then pour over the warm cake. 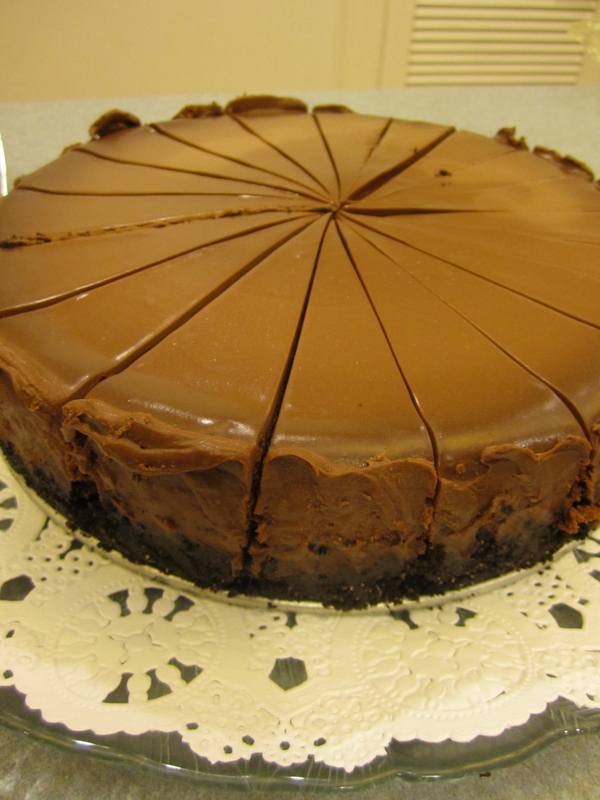 Then, in order to make it extra special, I made a chocolate cheesecake. This was my first time making a cheesecake. It’s a little time consuming, but totally worth it. This turned out so well! In fact the birthday girl herself said it was the best cheesecake she’s ever had! Preheat oven to 400°F. Line the bottom of a 9″ springform pan with a round of parchment paper. In a medium bowl, combine the cookie crumbs, sugar, and melted butter. Mix with a fork until all the crumbs are moistened. Add the crumb mixture to the springform pan and gently press about 1 inch up the sides and in an even layer over the bottom. Bake for 10 minutes, then transfer to a wire rack to cool. For the filling, combine the sour cream, vanilla, and espresso powder in a small bowl. Whisk to blend and set aside. Melt the chocolate in a double boiler until completely smooth. Set aside and let cool slightly. Beat the cream cheese, cocoa powder, and salt with an electric mixer until smooth and fluffy. Beat in the sugar and continue mixing, scraping down the sides as needed. Add the cooled chocolate and mix well. Beat in the sour cream mixture, then beat in the eggs one at a time until just incorporated. Don’t over-beat the eggs or the cheesecake will puff too much. Pour the filling into the cooled crust. Bake until the center jiggles very slightly (mine was still pretty jiggly), about an hour. Transfer to a wire rack to cool for about two hours before covering and refrigerating for at least 8 hours or overnight. After a few hours in the fridge, top with the chocolate glaze. Bring cream to a simmer in a small saucepan. Turn off the heat and add chopped chocolate to the saucepan. Let sit for 1 minute, then whisk until smooth. Add butter and whisk until incorporated. Pour the glaze over the chilled cheesecake. Chill thoroughly. To serve, carefully unmold the sides of the pan. Run a sharp knife under hot water to warm the blade, and wipe dry. To slice cleanly wipe the blade clean after each slice. Serve chilled.